Google Chrome has just hit the world. The number of applications, tweaks and tips released for Google’s first web browser Chrome is increasing daily. There is no problem to backup Google Chrome profiles manually by copying all files stored in the Documents and Settings\username\Local Settings\Application Data\Chromium\User Data folders to another location. 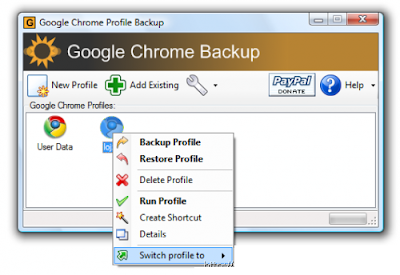 The Google Chrome Backup application was designed to be a small tool to backup and restore Google Chrome profile. The profile holds personal data like history, bookmarks, etc. Everything is done with single click. Another interesting aspect of Google Chrome Backup is that it can also create profiles for the browser. You need Google Chrome installed in order for this tool to work. It supports 0.2.149.27 version of Google Chrome or Chromium, but also newer builds. To use chromium please select a path within the Google Chrome Backup. To backup current profile click on the profile, select “Backup Profile” and select a backup path. A new file which holds your profile is created. To restore the old profile, click on the profile, select “Restore Profile” and navigate to *.gcb file you want to restore. Selected profile will be deleted and restored from the backup file. To delete Google Chrome or Chromium profiles select it from the profile list and click with rigth mouse button and select “Delete profile”. You will completely delete profile folder and custom settings associated. Use tray icon for fast access and to fast run any profile. Select option to run Google Chrome Backup at Windows Startup.